What Size Powder Coating Oven Do You Need For Your Operation? Home » Latest News » What Size Powder Coating Oven Do You Need? What Size Powder Coating Oven Do You Need? If you’re looking to buy a new powder coating oven, one of the first things you should determine is how big the oven will need to be. The size of the oven determines what kind of work you can do and how much work you can get done at one time, so making sure you have the right size appliance for your operation is critical. How Big Is The Largest Object You Want To Powder Coat? Powder coating ovens can be built to nearly any height, width or depth. When you acquire a new curing oven, the ideal size is dependent upon what you are going to be coating. No matter what you want to coat, the entire object needs to fit inside the oven without being jammed against the ductwork where the heated air enters the oven. Hot air is usually blown into the oven via ducts in the ceiling or walls. You can’t position parts too close to the ducts or the powder can get blown off. The parts can’t touch the ceiling or walls either, and they can’t impede the operation of the doors. If a part touches the oven’s ceiling or walls, the powder is likely to either rub off or flake during curing. When it does, you’ll need to redo the part to get a proper finish. Also consider how the parts will be carried in and out of the oven. Most parts are hung on rolling racks and there has to be enough room for the rack to fit into the oven once the parts have been hung. If your rack or cart bumps into the walls of the oven, the powder you just applied can get knocked off. Take racks into account when sizing your new oven. One last thing to consider is the performance of the oven. Some ovens have better temperature uniformity than others, but none are perfectly uniform. Ovens with ceiling ducts are usually cooler at the floor than elsewhere. Ovens with wall ducts may be cooler in the corners, as well as near the floor. Just like you will need to allow room near the walls, ceiling and ductwork, you also need to avoid hanging parts so that they nearly drag the ground. If possible, size your oven so that the biggest parts are still 10” or more off the floor. This helps improve the uniformity of the temperature of the parts, which enables a better finish. It also helps prevent dust contamination, which can occur when the oven’s heat system blows dust and dirt from the floor onto the parts. IMPORTANT: When sizing, make sure the part you are coating will fit entirely inside the oven without angling. Many new coaters buy 20’ long ovens because they want to be able to coat 20’ lengths of material like handrail or tube stock. To fit 20’ lengths of material into the oven, they have to be rolled in at an angle so they are positioned diagonally inside the oven, or they have to be hung at an angle with one end much closer to the floor than the other. Otherwise, they will touch the doors and/or the back wall. These positions are not very efficient because you can’t fill the oven with material if it has to be tilted to one side or hung at an angle. If you want to cure 20’ lengths of powder coated material, buy an oven longer than 20’. Determine your production throughput requirements. When we say throughput, we’re talking about the number of parts powder coated during a given shift, day or work week. One of the easiest ways to get the correct amount of throughput is to get the right size powder coating oven to start with. For example, if you are frequently powder coating rims, but only need to coat four at a time, a small walk-in oven will suffice. However, if you need to coat forty rims at a time, a larger powder coating oven will help you reach your production goals with less work because you won’t get bogged down with handling issues as you load and unload the oven over and over again to reach your goal. Throughput is tied to pacing. One thing that can slow down your operation is if your coaters have to be extra careful moving parts in and out of the oven because the rack fits too tightly into the oven. That delay, even just a couple minutes at a time, can significantly decrease throughput as the parts are moved over and over throughout the day. How Much Space Do You Have For Your Powder Coating Oven? This seems self-explanatory, but every year we hear about shop owners or coating line managers that didn’t correctly measure the available space in their facilities. If you need a walk-in sized powder coating oven, you are dealing with an appliance (and installation space) that is larger than it looks, so we always recommend tool-measuring the available space before making any purchasing decisions. You must account for low ceilings, odd roof grades, inconspicuous purlins or trusses, floor issues, HVAC/fire suppression/electrical/air/gas runs, posts or columns, unusual structural steel, lighting or anything else that might impact the installation or operation of the equipment. In addition to the appliance itself, you will need to account for staging areas. We recommend at least two staging areas for your powder coating oven. First, you’ll need a designated area where the parts will sit prior to being loaded into the oven. This area should have no traffic if at all possible, as any handling or jostling in this area can knock off powder that was just applied in the booth. Second, you’ll need a separate cool-down area once they parts have been cured. Another thing to keep in mind is that most carts can’t make a true 90° turn, so allow for the turning radius of each cart and don’t place equipment too close together. Determine The Exact Footprint And Dimensions – Don’t Guess. All of Reliant Finishing Systems’ powder coating ovens are sized using the actual interior dimensions. Our popular PCO8825 is 8’H x 8’W x 25’L INSIDE the cabin. The exterior dimensions add an additional 2′ of height for the overhead plenum and insulated roof, plus an extra 1′ to both the width and length because the walls and door assemblies are 6″ thick. So, a PCO8825 is actually 10’H x 9’W x 26’L. In addition, each powder coating oven comes with at least one heat unit and exhaust fan. The heat units have a 4′ x 4′ footprint when erected, and are as tall as the oven. The exhaust adds another 27” to the oven’s overall width or length, depending on mounting location. 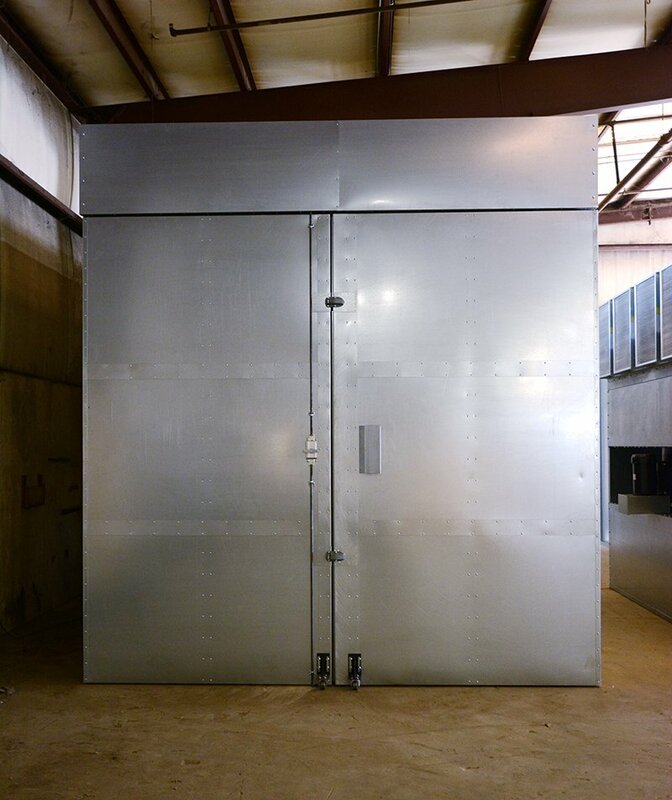 A typical 8’H x 8’W x 25’D powder coating oven with a rear-mounted heat unit and side-mounted exhauster will require a space that is over 10′ tall, a little less than 12′ wide and about 30’ deep. IMPORTANT: Don’t forget to allow room for the swing arc of each set of doors on the oven, and remember that local codes may require 3′ of clearance around the entire oven. Plan For Success By Allowing For Growth! Nobody ever says, “I should have bought a smaller oven.” We tell anyone considering a new oven to purchase the largest powder coating oven they think they will ever need. Although our ovens are modular in design and can easily be expanded, it is more affordable to get a larger oven right from the start. Why go big? If you are planning on opening a powder coating job shop, the larger the powder coating oven you get, the more jobs you can potentially take in. A large oven allows you to take on bigger projects, such as coating exceptionally long, tall or wide parts. You can also coat handrails, structural steel or fence sections in bulk. Since you can’t effectively cure a part that won’t fit completely inside your oven, the size of your oven dictates the biggest job you can ever take on. It only takes a few of those big jobs to more than pay for the upgrade to a larger oven. If you’re a manufacturer bringing your coating work in-house, your coating line’s productivity is going to be closely tied to the size of your powder curing oven. A bigger oven pays off because it allows you to do larger batches of regular-sized parts at the same time. If you are going to be doing parts smaller than about 4’ x 4’ x 4’, it is easy to justify buying a large truck-in or small walk-in oven. But, by installing a larger oven, you can ramp up your production capabilities and dramatically increase your throughput. You can also use the extra oven space to help catch back up if you have problems or encounter unexpected reworks. Still have questions about the size of the powder coating oven you need? Our systems specialists will be glad to help you get the exact system you need. Give us a call today. This entry was posted in News on March 15, 2016 by Reliant News.